Gobble Gobble!! How is your Thanksgiving going? Turkey basted? Potatoes mashed? Yams baked? We’re going to a friend’s house for a potluck Thanksgiving this year, and I got appetizer and salad. Talk about putting the “luck” in potluck! Good thing, too, because what with today’s Turkey Trot race, cooking a bird – or as BabyRuns used to call it, a piglet – would’ve put me in a time crunch. 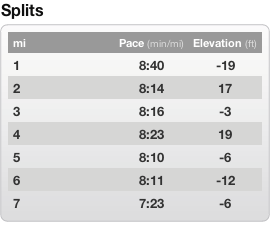 On the flip side, I had an awesome Trot this year, so let me sing its praises right now. 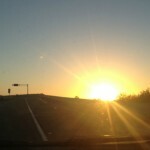 Wake up call was at 6:00 a.m., so I could get to the 7:50 a.m. start on time. 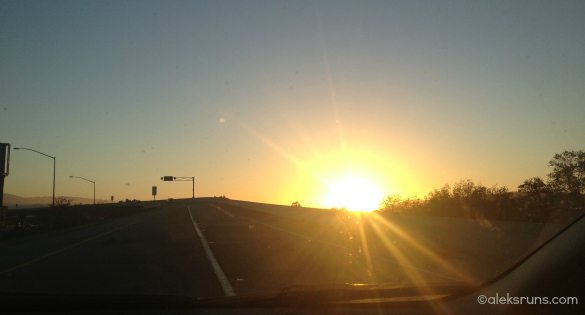 The sunrise was pretty! 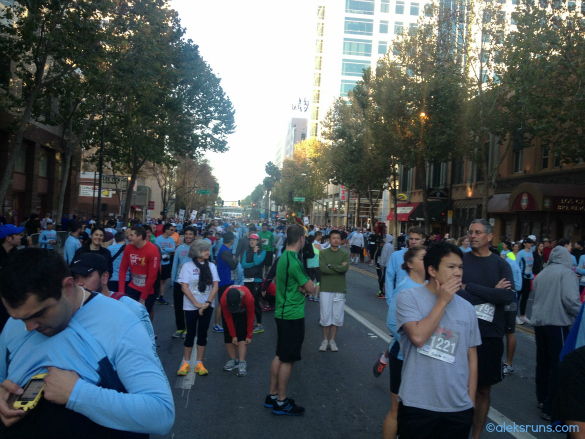 This was my second year running the Silicon Valley Turkey Trot and let me tell you — the streets of San Jose may be wide, but with 20,000+ runners things get tight pretty quickly. Last year’s race was a logistical disaster. The city closed the freeway exit leading up to the start area hours earlier than planned and hundreds of us were late, stuck in bottleneck traffic for 40+ minutes. The Finish line was so crowded, we literally had to stop and stand in place for at least a couple of minutes before we could actually cross. Overall, the race felt too crowded to enjoy. But the race organizers sent an email detailing how each of these problems will be addressed this year, so I decided to give it a chance. I’m glad I did, because this year’s race was a whole other ballgame! The start and finish area were in a different location (a much wider street), traffic was not a problem, and things went pretty smoothly from the get-go. The start area, runners and runners and runners, as far as the eye can see. Just the way I like starting my weekend Thanksgiving holiday! 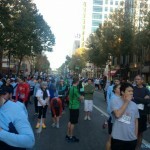 I lined up in my proper corral – the 8-9 minute-mile – but so did many, many people who did not belong there! 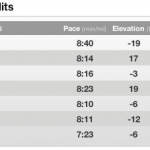 I spent the first three miles zig-zagging and passing others. Passing runners can be a great confidence booster during a race. Zig-zagging, however, gets annoying quickly. I guess I should’ve stretched too, but I was in a hurry to get back home and pick up BabyRuns. 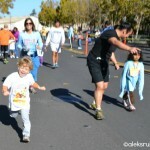 He ran the Kids Fun Run, which sadly was just as chaotic as it was last year, if not worse. I think that girl in the blue shirt didn’t, though? 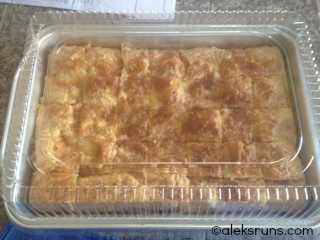 Thankfully, my mom saved the day by baking a second (emergency) banitsa. 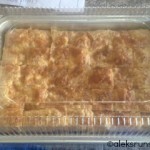 Banitsa is a pastry-type cake made with filo dough and cheese. I promise, it’s much yummier than it sounds. This year, I am grateful for my family, a wonderful run and my mom’s amazing cooking skills! ← What Should I Do With All Those Medals? 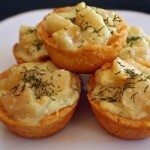 I am thankful for you sharing the photo of the tartlets because much of my cooking turns out like that too. 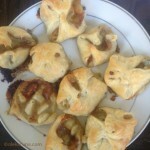 LOL, I don’t know… following a recipe doesn’t seem all that difficult (at least no more difficult than running 13 miles?) But there. 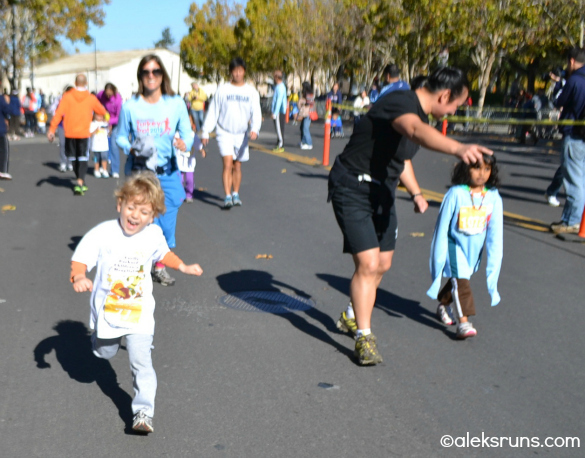 Hope your Thanksgiving run was fun!